I imagine numerous essays and books have been written on the subject of art attempting to depict incredible things described in literature. From indescribable beauty to unimaginable horror, countless authors have included such elements in their stories with little or no effort. “A face more beautiful than any that of any man or woman who ever walked on the earth” is an easy enough phrase to write, but would probably not be done justice by any visual representation other than a photo of that very face (if it actually existed). H. P. Lovecraft is one author who thrived on describing things in his stories more by the emotion they evoke in the people exposed to them, and less by detailed physical delineation. In The Call of Cthulhu, sculptures and idols of the title character (an ultimate evil) are described as “simultaneous pictures of an octopus, a dragon, and a human caricature…a pulpy, tentacled head surmount[ing] a grotesque and scaly body with rudimentary wings”. A first hand account of Cthulhu itself merely reveals that the “thing cannot be described”. Many depictions of Cthulhu have been attempted, ranging from realistic to absurdly cute. But most similarity between depictions comes from a familiarity with famous works; Lovecraft’s descriptions leave much to the imagination. But horrors like Chuthlu are supposed to be visually terrifying by their size and strangeness (one wouldn’t expect a painting or figure to try to imitate a stench or sound). A skilled artist could conceivably (and likely did) create a representation of Cthulhu that would have impressed Lovecraft himself. Other Lovecraftian horrors simply can’t be successfully recreated by any artist, and I doubt Lovecraft would have cared for anyone to try. Obviously no artist would ever be able to recreate such a painting, unless they find a nightmare-spawning wand brush down at the art depot. But I can’t blame someone for trying, just for the fun of it. It is difficult (though surely not impossible) to make truly frightening, photo-realistic art without employing gore or other violence. Iowa native Stephen Gammell significantly contributed to my childhood fear of the dark with his deeply disturbing illustrations for the children’s Scary Stories to Tell in the Dark book series. But his black and white sketches are far from photo realistic, accomplishing their goal through dreamlike wisps of suggestion, decay, and the uncanny. Goya’s Saturn Devouring His Son is disturbing, while it’s more realistic predecessor, Peter Paul Rubens’ Saturn Devouring His Son is unpleasant but not nearly as unsettling. Taking horror from words to images involves walking a fine line. Hitchcock said “Suspense is like a woman; the more left to the imagination, the more the excitement”. The stuff our imaginations tend to use to fill in the blanks is almost always going to be greater than any rendition of the real thing. I agree – and while I’m not that familiar with Lovecraft – I think it applies to film as well. 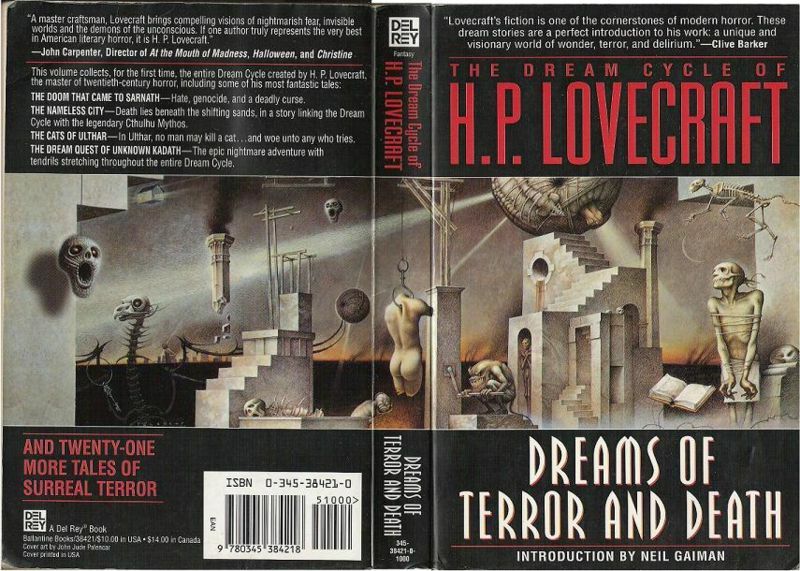 There must be a reason why Lovecraft chose the medium of writing to depict such wild visual horrors: it is well-accepted that one can only approximate a picture in words, and that wide unknown is not only more compelling, but the stuff of horror itself.